London - ShotHotspot.com is a new search engine for finding photo hotspots all over the world. 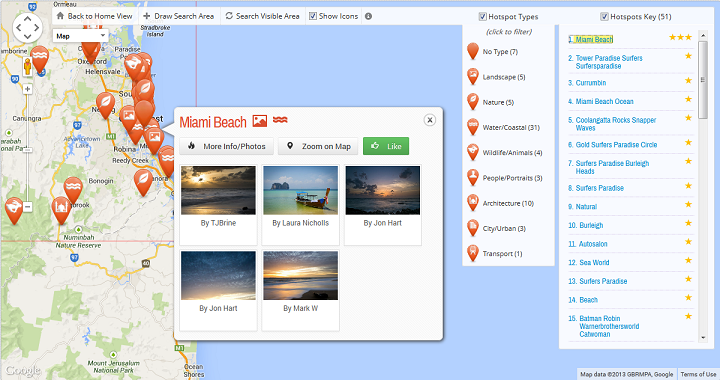 Unlike similar sites which simply search through locations that users have added, ShotHotspot uses the location info of images on Flickr and Panoramio. This provides the search engine with millions of potential hotspots covering many areas of the world. Once hotspots have been found, or 'spotted', by users, they are stored in the ShotHotspot database. A number of factors such as liking, commenting or viewing of a hotspot then determine its ranking within the ShotHotspot search engine. The site was created by amateur photographer Darren Johnson who was frustrated that nothing like it existed. "About six months ago I got fed up with feeling like Columbo trying to piece together scraps of information on forums as to good photo locations to visit," explains Darren. "I've developed ShotHotspot in a way that allows the database of hotspots to grow organically as people find new places, and the search engine will become even more accurate with time." ShotHotspot was developed by Darren Johnson in 2012, and went live in March of 2013. It is currently in the final stages of a public Beta.